In the context of the UK’s referendum on membership of the EU, Clare Llewellyn and Laura Cram are investigating how people use social media to talk about the UK-EU relationship. They provide the first update on the project, which has a presence on Storify, explaining the process of building a dataset on Twitter to keep track of the discussion. We are building a dataset to explore the relationship between the UK and the EU and how people talk about this relationship. 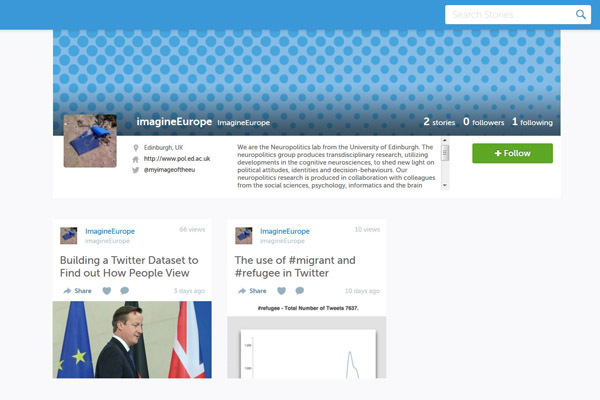 We are using social media – in particular Twitter – to find out what people are saying and to investigate how this changes leading up to a referendum on the UK’s membership. Comments policy and publication guidance. Clare Llewellyn is PhD Candidate in Informatics at the University of Edinburgh and Research Assistant in the European Union in the Public Imagination project. Her research focuses on user-generated content on the Internet.